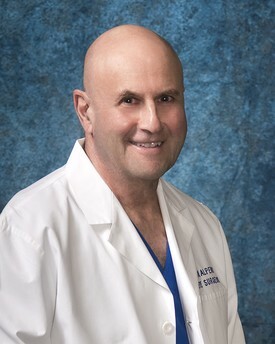 Dr. Louis M. Alpern, M.D., M.P.H., F.A.C.S., F.I.C.S. Dr. Louis Alpern loves providing quality eye care to the people of the city of El Paso and the surrounding communities. “I can’t think of anything more rewarding than working with someone who is blind or partially sighted and helping them see again,” he says. Dr. Alpern earned his Medical Degree from Harvard Medical School and Masters in Public Health Degree from the Harvard School of Public Health. He served a rotating internship at Hartford Hospital in Hartford, Connecticut and completed his ophthalmology residency at Washington University/Barnes Hospital in Saint Louis, Missouri. Dr. Alpern has a keen interest in the newest developments in medicine, and has collaborated with companies like Alcon, Allergan, and Pfizer to research the newest treatments for glaucoma, cataracts, ocular allergy, and dry eye. Dr. Alpern developed an intraocular lens implant with Alcon Laboratories which was widely adopted by eye surgeons around the world for cataract surgery. He is board certified by the American Board of Ophthalmology. He was awarded fellowship in the American Academy of Ophthalmology, the American College of Surgeons, and the International College of Surgeons. He is a member of the American Medical Association, Texas Medical Association, El Paso County Medical Society, Texas Ophthalmological Society, and American Society for Cataract and Refractive Surgery. Dr. Alpern has provided free medical services to those in need on both sides of the border with See International, and founded Vista Entre Las Fronteras, an organization that provided free cataract surgery to those in need. Out of the office, Dr. Alpern enjoys horseback riding and skiing whenever he gets the chance.